The president said at his annual news conference that the impact of Brexit in Russia will be minimal and indirect. "It will be minimal," the president said, responding to a question concerning the effect of the United Kingdom’s withdrawal from the European Union for Russia. "It will affect the whole European economy, the global economy," the head of state said. "It will affect us in this sense too, indirectly and not immediately," Putin added. The Russian President noted that he understands the position of United Kingdom’s Prime Minister Theresa May on this matter. "The referendum passed; what she has to do? She should implement the will of the nation expressed at the referendum," Putin said. Relations between Moscow and London are currently in the dead-end, but finding the way out would be in the interests of both countries, Putin said. "Russian-British relations are in the dead-end and it will be in the interest of both countries to find the way out of it," he said. The Russian president said that the British business is interested in the partnership with Russia and businessmen speak about it at various discussions with the Russian side. "There are a lot of directions [for cooperation] and I hope that the common sense will prevail," Putin said adding that top companies of the British economy such as BP had been long working in Russia "and want to continue their work." Putin also said that during the G20 summit in Argentina he had a brief encounter with British Prime Minister Theresa May. "A lot of encounters happen at events such as G20, it is impossible to recall them all," he said. "Everything is on the sidelines and afoot: you stand up, go and walking side by side say hello and add a couple of words. In a similar format with the British premier we said hello to each other and exchanged a couple of words." The president said that Russia is concerned over the plans to deploy elements of the US global missile shield on the territory of Japan. "Of course, we are concerned over the plans of deploying anti-ballistic missile defense systems. I have spoken on many occasions and can say once again: we do not consider these systems as defense weapons. This is part of the US strategic nuclear potential brought to the periphery. And these systems operate synchronously with strike complexes," Putin said. Russia remains curious about the level of Japan’s independence from the United States in the sphere of security in making decisions to host US military infrastructures, he went on. He pointed out that it was essential to bear in mind security issues in concluding a peace treaty. "The degree of Japan’s ability to participate in making such decisions [on hosting US military infrastructures] is unclear to us. We are curious about the degree of Japan’s sovereignty in making such decisions," he said. Russia sincerely seeks to conclude a peace treaty with Japan. "We sincerely seek and will continue to seek to sign a peace treaty with Japan," he said. "I am convinced, and this conviction is shared by [Japanese] Prime Minister [Shinzo] Abe, that the current state of affairs is abnormal," Putin went on to say. "Both Japan and Russia are interested in mending our relations, and not only because we need something from Japan from the economic standpoint." According to the Russian leader, the process of signing a peace treaty is complicated, but Russia is ready to move along this path, together with its Japanese counterparts. The Russian economy has already adapted to external restrictions, Putin said. "Our economy has already adapted to these external restrictions," he said. Putin recalled that the Russian economy after the crisis of 2008-2009 fell by 7.8%, and after the introduction of sanctions in 2014, the decline was 2.5% (in 2015). He referred to the assessment of the US Treasury, which attributed one third of the 2.5% decline to the impact of sanctions, and two thirds - to a drop in energy prices. "I think that it is much less than one third," the head of state noted. The circulation of the dollar in Russia is not banned and won’t be banned, Putin said. "As for dedollarization, it is connected exclusively with settlements between economic entities, and in no way concerns citizens," he said. Putin noted that the new law prohibiting street boards with currency rates has raised questions among citizens. In particular, they wonder if this is connected with some kind of ban on the use of dollars. "There is nothing and there won’t be anything of the kind, let me make everyone easy," the President assured. The president said that national GDP rose by 1.7% in ten month of this year and the forecast for the yearly growth rate is 1.8%. "GDP increased by 1.7% in ten months of this year. The annual forecast of the Ministry of Economic Development is 1.8%," the president said. Putin noted that the industrial output was growing at a quicker pace at the same time: the increase was 2.1% in 2017, 2.9% in January - October 2018, and 3% growth is forecast as at the year-end. Processing industries are growing slightly quicker, at the level of 3.2%. "Capital investments increased by 4.1% in three quarters. Freight turnover and retail trade volumes are rising - plus 2.6%," Putin noted. Putin said the federal budget surplus of 2.1% of GDP is a good indicator of the Russian government’s work. He noted that for the first time in Russia, since 2011, the federal budget has a surplus of 2.1% of GDP. "And this is good," Putin said. According to him, "this is a good indicator of the work of the government, the economic sector of the government." 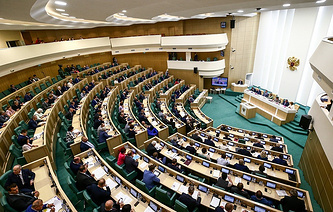 At the same time, Putin drew attention to the existence of a non-oil and gas deficit, which next year should be reduced to 6% and remain at this level for subsequent years. According to him, "the VAT increase is linked to the need to keep this indicator in place." Consumer demand has increased notably and this is a positive factor, the head of state added. Putin said the growth of the public’s real incomes had reached 0.5% in 10 months of 2018. "After a long break, a slight, but still positive trend for growth of real disposable incomes of the population was recorded. According to the latest data, it was 0.5%. I hope that this trend continues as the real wages grow - over 10 months of this year the figure reaches 7.4%, and by the end of the year, around 6.9-7% is expected," Putin said. Inflation would go beyond the Central Bank’s target to 4.1% by the end of 2018, Putin said. "Inflation remains acceptable for us, though it edged up slightly over the past week, by half a percent I believe, which is why (inflation) will go beyond the Central Bank’s target of 4% to 4.1-4.2%," he said. Slight growth of inflation due to increase of the value added tax (VAT) is expected to be limited to the beginning of next year, Putin said. "I expect that this will be a one-time phenomenon and even a slight growth of inflation at the beginning of the year passes and then it will decline," Putin said, answering the question about the consequences of increasing VAT rate from 18% to 20%. He noted that the Central Bank is taking certain steps to prevent growth of inflation, including the recent decision to increase the key rate from 7.5% to 7.75%. Putin noted, it is both positive and negative, "but this is also done in order to avoid rising inflation." Putin noted that in many countries VAT is 20% and higher, while in Russia, even after raising this tax, the so-called effective VAT rate for the economy as a whole will be less than 20%, since almost all the benefits for medicine, children's goods, IT companies and so on, remained unchanged. In general, the President called the decision to raise VAT "correct and balanced." "Plus, this, of course, gives additional budget revenues and the possibility to fulfill our development plans in the framework of national projects," he said. 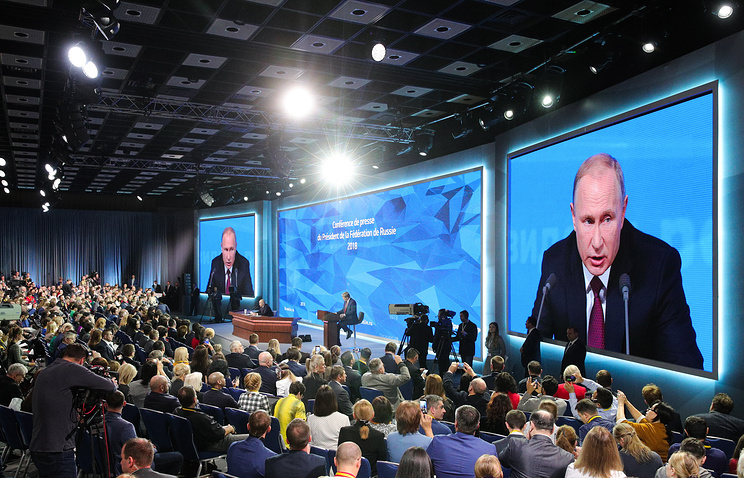 As for the impact of this step on the growth of tariffs for housing services and utilities, Putin noted that in recent years this figure has increased by around 4%, and next year it will grow by a total of 4.1%. At the same time, tariffs will be increased in two stages. The investments in fixed assets in Russia for three quarters of 2018 are up by 4.1%, the president said. "The industrial production grew at a faster pace. If last year the growth was 2.1%, in January - October of the current [year] - 2.9%, by the end of the year 3% is forecasted. At the same time, the manufacturing industries are growing slightly faster - 3.2%. During the three quarters, the investments in fixed assets amounted to 4.1%. The turnover and retail sales are increasing, plus 2.6%," the president said. Russia will have to keep strengthening its military base in Tajikistan until the situation in neighboring Afghanistan is settled, Putin said. 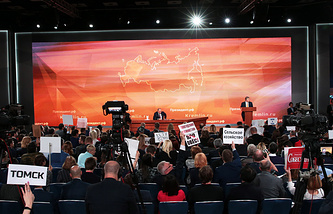 Putin set up a tradition of annual meetings with journalists in 2001. A short break was made only when Putin was Russia’s prime minister, from May 2008 to May 2012. The practice was resumed in 2012 after Putin was elected Russian president for his new, six-year term. Putin’s question-and-answer sessions traditionally start at noon. As a rule, they last for several hours. That is why they are often referred to as the president's ‘big’ news conferences. It is up to the president to decide when to end the event. The first news conference in 2001 was the shortest one, having lasted for one hour and 35 minutes. The longest one took place in 2008, when Putin fielded questions for four hours and 40 minutes. Starting from 2004, none of the annual news conferences lasted more than three hours. In the recent years, these news conferences were organized in December giving the president an opportunity to sum up the results of the outgoing year. Reporters are free to ask any questions they like.